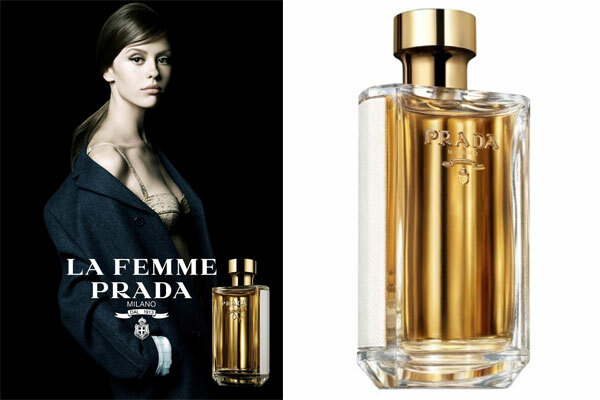 La Femme Prada by Prada - A floral fragrance for women. Created by perfumer Daniela Andrier with notes of frangipani, iris, ylang-ylang, tuberose, beeswax, vanilla, and vetiver this classic scent has an floral femininity. This is the female counterpart to L'Homme Prada. The scent duo was launched in August 2016 and available in an eau de parfum spray and matching body products. The fragrance campaign features actors Mia Wasikowska and Mia Goth shot by Steven Meisel. "The instinctive, human, highly crafted and boundlessly imaginative approach that Prada ascribes to the making of fragrance is everywhere present in the 'olfactory maps' for both La Femme Prada and LHomme Prada. Designed to take the wearer on a voyage through place, memory and time, somehow there appears a sensual meeting point for these distinct female and male fragrances to consummate an aesthetic relationship through experimentation and tradition.